Interested in Scouting? Troop 293 Meets Here. Troop 293 is Scout-lead and patrol-oriented. Teams of boys, called patrols, who are similar in age, development, and interests, work together on a variety of projects. These projects range from completing merit badges to cooking dinner (and clean-up!) on outings. While the adult leaders provide general guidance, it is the Scouts of Troop 293 who decide the Troop’s activities for the year. And it is the Scouts who plan the details of each outing. As Scouts in the patrols get older, they gain experience and develop Scouting skills. Patrols of older Scouts typically work with patrols of younger Scouts to help the younger Scouts develop Scout skills and knowledge. 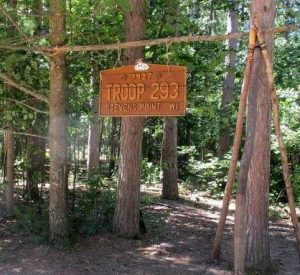 Boy Scout Troop 293 of Stevens Point, Wisconsin was chartered in 1941 and is one of the oldest troops in Portage County. Trinity Lutheran Church is proud to sponsor Troop 293. Troop 293 meets regularly on Monday nights from 6:45 to 8:30 PM at Trinity Lutheran Church during the months of September through early June. A typical meeting consists of an opening ceremony, announcements, planning for outings, development of Scout skills, a Scout Master minute, and a closing ceremony. Three or four times per year the Scouts, and their families, meet in a court of honor to share a meal, receive honors such as rank advancements and merit badges, and to enjoy each other’s company. 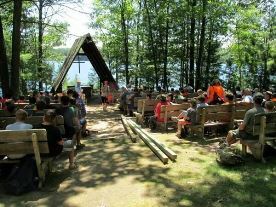 Troop members and their families can catch up on the recent activities at Troop 293’s Facebook page. Interested in Cub Scouts? Pack 293 is for boys ages 7-10 or grades 1-5. Click here for more information.